Last Friday afternoon, my blogging daughter, Louise (at thestorytellersabode) and I decided to drive out to the Japanese Garden, located at North Clifton, near Newark in Nottinghamshire. It’s a mere 6.4 miles from where I live, so it took no time at all to get there. I hadn’t visited the Garden since 2008, and Louise had never been before, so it made a nice change for a gloriously sunny day. Maitreya (Koji Takeuchi) was born in Handa, near Nagoya in Japan. In his teens he began a search for the truth. He was first led to Christianity but found it did not give him the direct experience of Jesus he wanted. So he turned to meditation and attended an intensive meditation course at a Zen monastery – and had the experience of ‘enlightenment’. Aiming to become a meditation master, Maitreya went on to complete an MA degree in Buddhism and lived the life of a Zen monk for a time – a life he found too harsh and rigid, and out of date. After travelling and teaching meditation in Thailand, Nepal and India, on the invitation of a friend, he eventually came to England. After staying at various universities around the country, teaching and lecturing, he came across a property for sale in North Clifton, Nottinghamshire. This became the base from which he taught meditation: ‘Pure Land’ came into being in 1973. 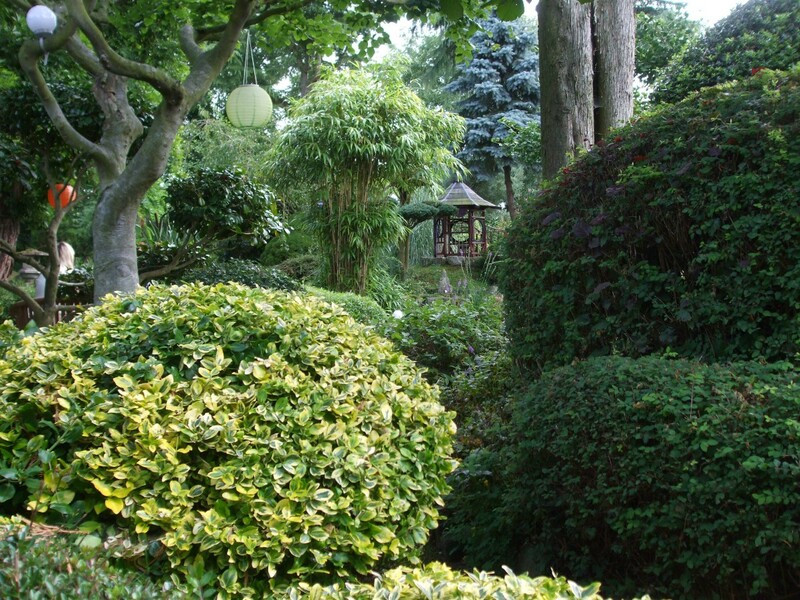 In 1980, Maitreya began transforming a flat, 2 acre field – a ‘wilderness’ – into a Japanese garden. His aim was to create a peaceful area which guests to his Centre could enjoy. He had no previous gardening experience, but he set about creating small ‘hills’ in this flat place that would remind him of his mountainous homeland, Japan. The material for these came from the earth dug out to create the ponds. 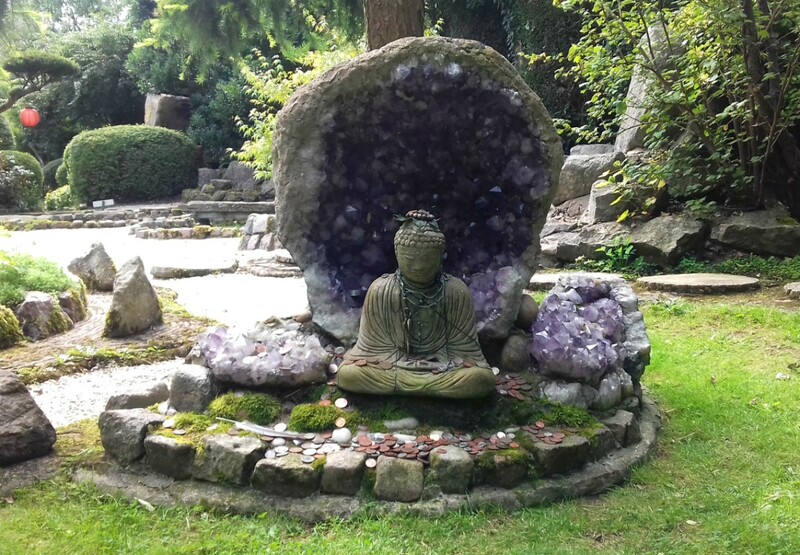 The large stones placed around the ponds came from a quarry in Derbyshire and the winding paths were determined by the positioning of the stones. Refreshments are available at a Japanese Tea House, which is also where payment is made on entry ((£7 for adults). A variety of teas are offered, including Japanese and English tea and various fruit teas. (I couldn’t say whether coffee is available as Lou and I asked for tea). People can either sit inside the very small place, or outside in the garden, as we did. An extra feature every year is that of the ‘Lantern Lit Evening Garden’, which can be enjoyed every Friday, Saturday and Sunday nights during August and September. There are a few reviews of the Japanese Garden online but not all are favourable. It’s undoubtedly a pretty site, but it is small. The main criticism about it is the price – that £7 is too much for such a small place. 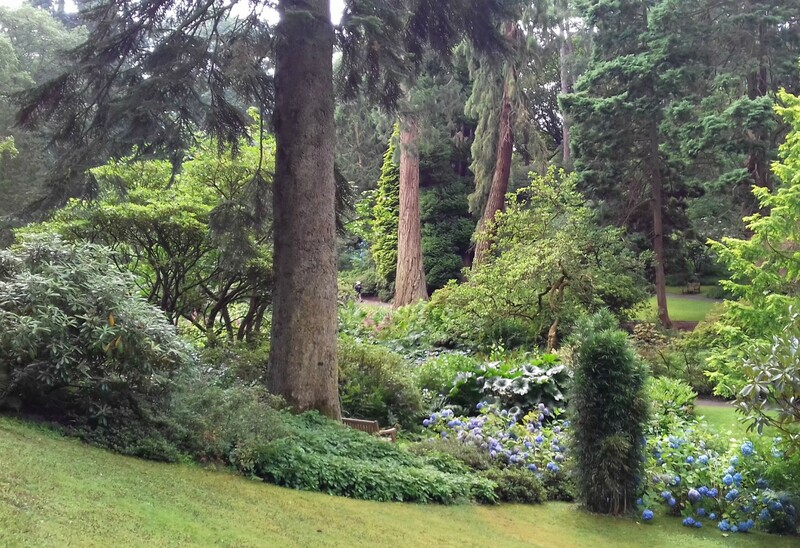 Admittedly, it’s possible to walk round quickly, but most people tend to linger and spend time sitting at various nooks around the place or in the tea garden. We also walked around more than once in order to catch things we may have missed or overlooked the previous times. It isn’t cheap, but I suppose it depends what you want from a visit to a place like this. Bodnant is a world famous garden, situated in the county borough of Conwy in North Wales, with wonderful views of the Conwy Valley and the Carneddau Mountains of Snowdonia. It is owned by the National Trust and visited by 190,000 people every year. Bodnant is a perfect place to visit at any time of year – as my aunt and uncle, who live almost on its doorstep, will confirm. It’s open for 362 days every year, closing only on Christmas Eve, Christmas Day and Boxing Day. The 80 acre garden is magnificent and has become a perfect venue for weddings. It is “home to the National Collection of Champion Trees”. Yet there’s much more to Bodnant than trees. Pochin’s daughter, Laura, married Charles Mclaren, the First Baron of Aberconway, and the Hall has been in that family ever since. It took successive generations of the Mclaren family to create Bodnant as we see it today, and although the gardens were given to the National Trust in 1949, the Hall remains the possession of the present Lord Aberconway and is not open to the public. 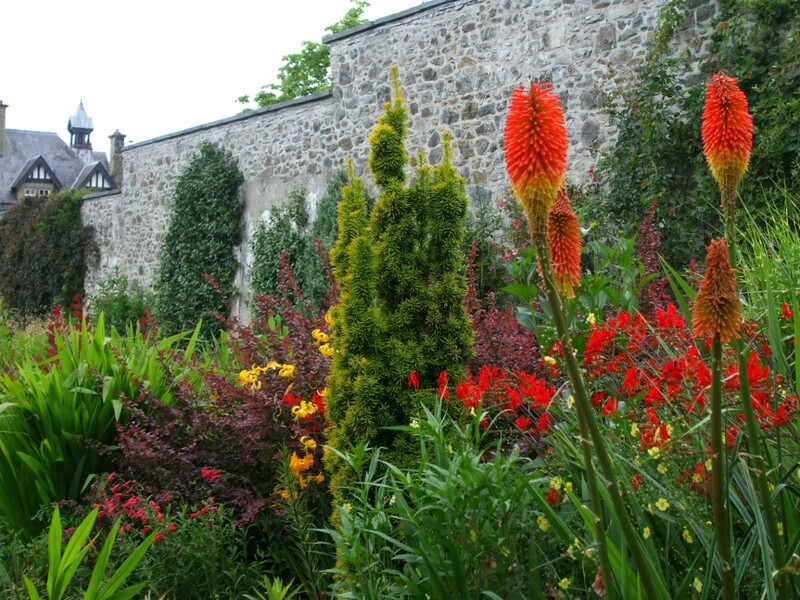 However, Lord Aberconway and his family are still actively involved in the Garden’s management and improvement. At the furthest end of the valley, and Bodnant as a whole, is a large pond called the Skating Pond. I can only imagine it got its name because it froze over in winter and was used (literally) as a skating pond. But it’s a pretty pond anyway, with a boat house to one side and edged by trees, including a few huge willows. 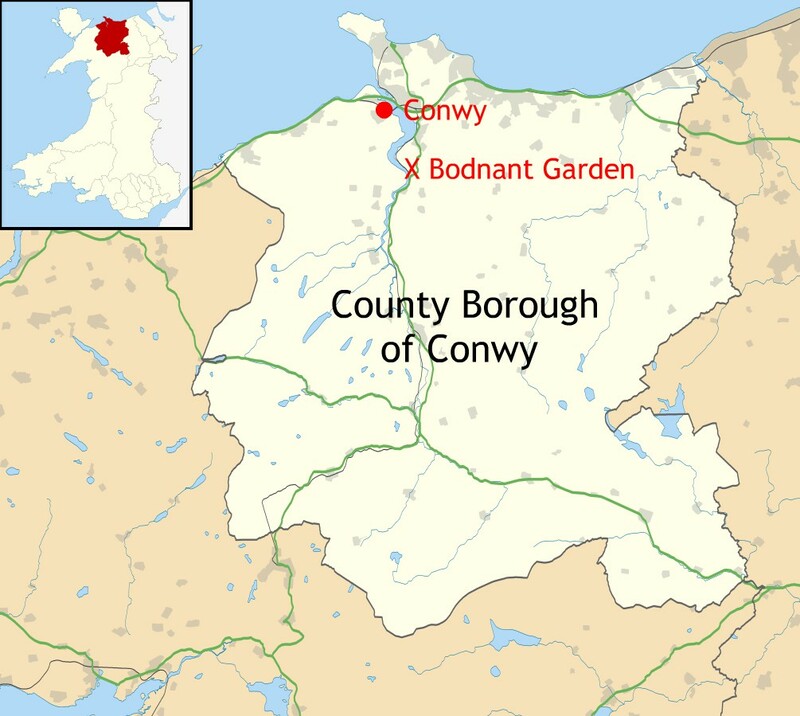 Car parking at Bodnant is across the road, but pedestrians reach the gardens via an underpass. There are four places at which to find refreshments. One of the cafes, which serves actual meals, is next to the car park and one that serves snacks and sandwiches is by the Entrance. The other two small places for light snacks and drinks are down in the Dell – one close to the Old Mill and another, which we’ve never used, is by the Skating Lake. 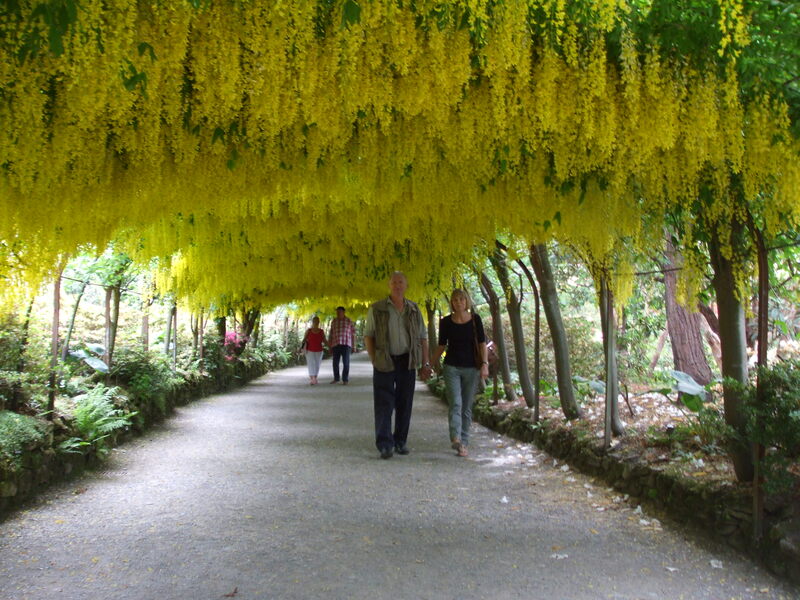 To finish with, this is a photo of the famous Laburnum Arch. If you want to see it in flower like this, June is the time to visit. 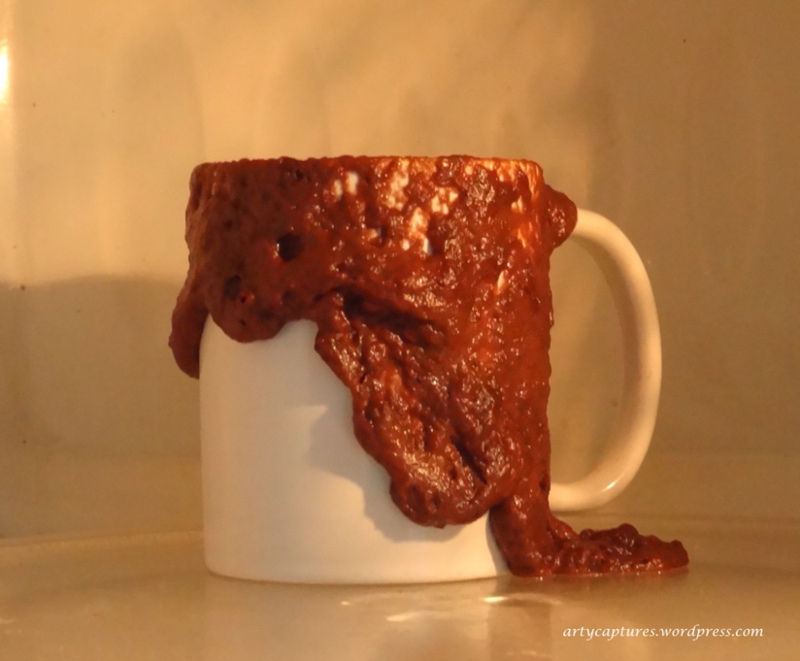 Zak’s temper boiled and finally erupted. He stomped round the room, fists striking at empty space. How could she! After the months of fun they’d had, he’d never imagined she’d betray him. 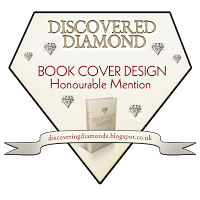 All he’d asked was her support of his work – and her discretion. His rage was rising again and he cursed. If he ever set eyes on Jodie again he wouldn’t be responsible for his actions. ‘Morning Zak,’ Roberts said as she swept in, a polythene bag full of jewellery in her hand. This is my story for Flash Fiction for Aspiring Writers The prompt was kindly provided by artycaptures. It’s the first flash fiction I’ve done for a while – in fact, it’s the first thing I’ve posted at all for a few weeks – so I thought it was time to change things. FFfAW is a writing challenge hosted by Priceless Joy. It involves writing a story from a given photo prompt in 100-150 words, give or take 25. If you’d like to join in, follow the above link to see what to do. The challenge runs from Tuesday – Tuesday every week. 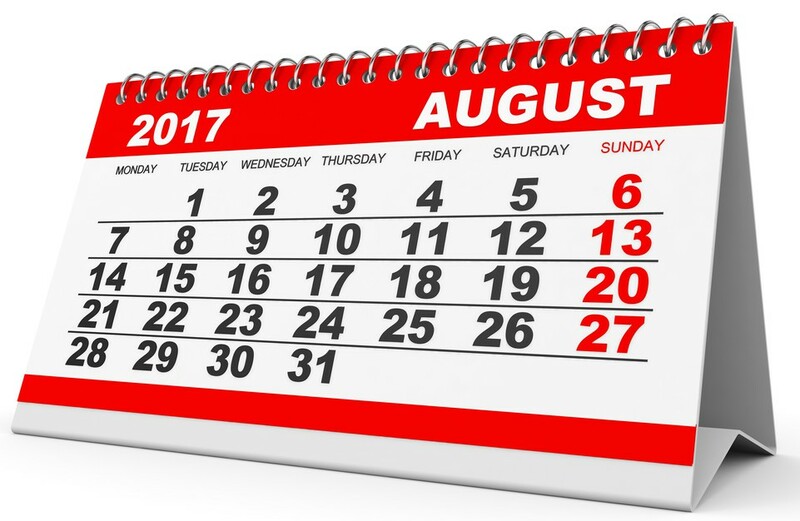 August is the eighth month of the year in the Julian and Gregorian calendars and the fifth month of the year to have 31 days. In the UK, the hottest days of the year are often in August and it is a busy time for holidays as it falls in the six week summer break for schools. 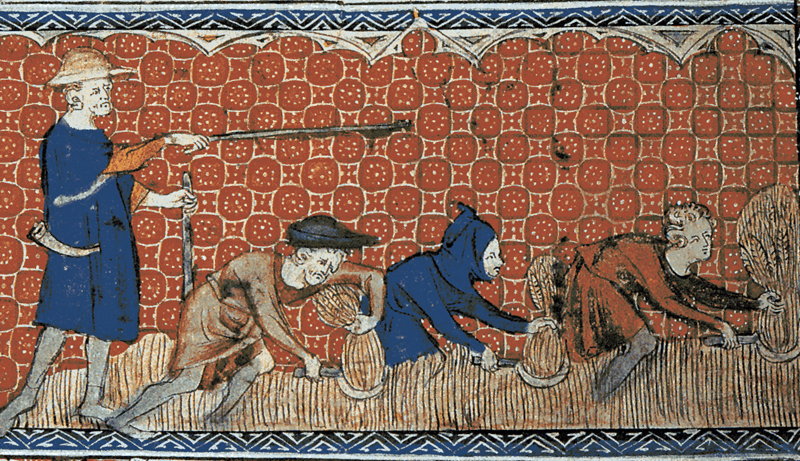 Similarly, in many European countries, August is also the holiday month for workers. In the southern hemisphere, August is the equivalent of February in the northern hemisphere. The original Latin name for August was Sextillis as it was the sixth month in the then Roman ten-month calendar, when March was the first month of the year. August became the eighth month around 700 BC when January and February were added to the year by King Numa Pompilius who gave it 29 days. The extra two days were added by Julius Caesar when he created the Julian calendar in 45 BC. In 8 BC the month was renamed August in honour of the first Roman emperor, Augustus Caesar (who ruled the Roman Empire from 27 BC until AD 14). Augustus is said to have chosen to name this month after himself because it was the time of several of his great triumphs, including the conquest of Egypt. 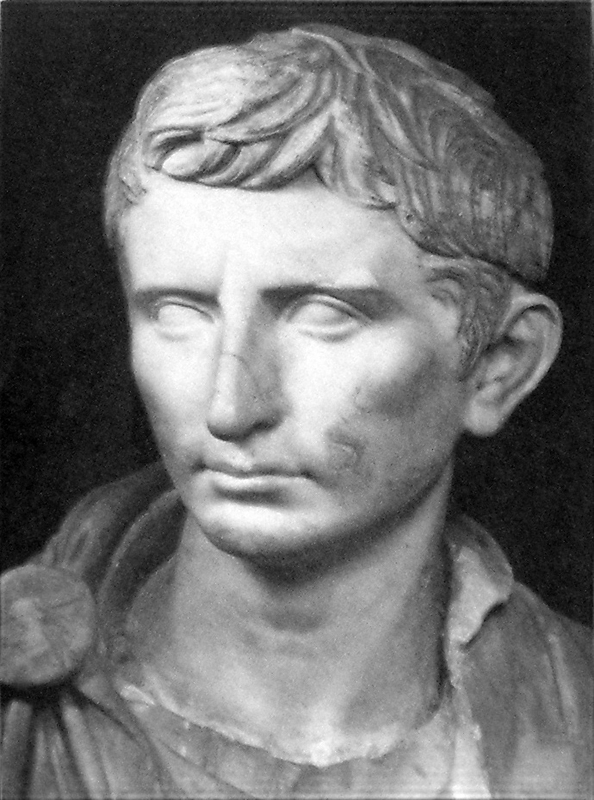 The Latin term Augustus mensis means Month of Augustus. 2. Its birth flowers are the gladiolus and poppy. The gladiolus represents beauty, strength, love, marriage and family. Poppies come in different colours but it is the the red one that is associated with August and it signifies pleasure. 5. Henry VI Part 1 and The Tempest are the only Shakespeare plays that mention August. 6. 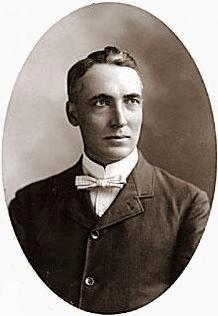 Warren Harding was the only US president to have died in the month of August. 7. 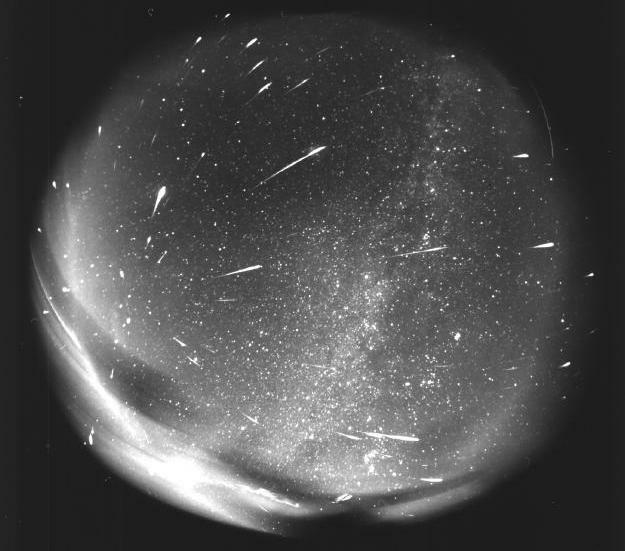 Certain meteor showers occur in August, including the Kappa Cygnids and the larger Perseids meteor shower. 8. In Ancient Rome, the festival of Supplica Canum was held in August every year. It was an annual sacrifice in which dogs were suspended from a furca, (fork) or a crux (cross) and paraded around the city. In the same procession, geese were honoured by being carried around adorned in purple and gold. The tradition stemmed from a nighttime siege of Rome by the Gauls during which the watch dogs failed to bark. On that occasion, it was the noisy, honking geese that alerted the city to the attack. The failure of the dogs led to them being ritually punished every following year. Gruesome! 9. 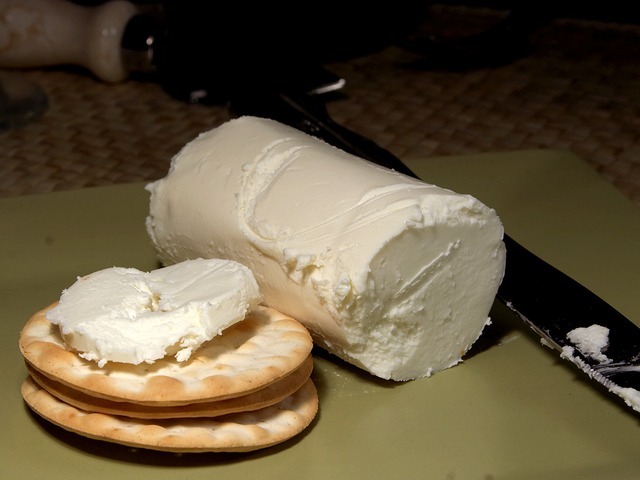 On a more cheerful note, August is National Goat Cheese Month in the U.S. I believe it involves the promotion of goats cheese as a healthier option than cheese made from cow’s milk. I love all cheese. In fact, I think I’m probably a cheeseaholic. In the medieval period, farmers made loaves from the new wheat at Lammas, and gave them to the church to use in the Communion. The custom ended when Henry VIII broke away from the Catholic Church in 1534. Today, harvest festival services are at the end of the harvest in September, with Michaelmas Day (Sept 29) traditionally being the last day of the harvest season. 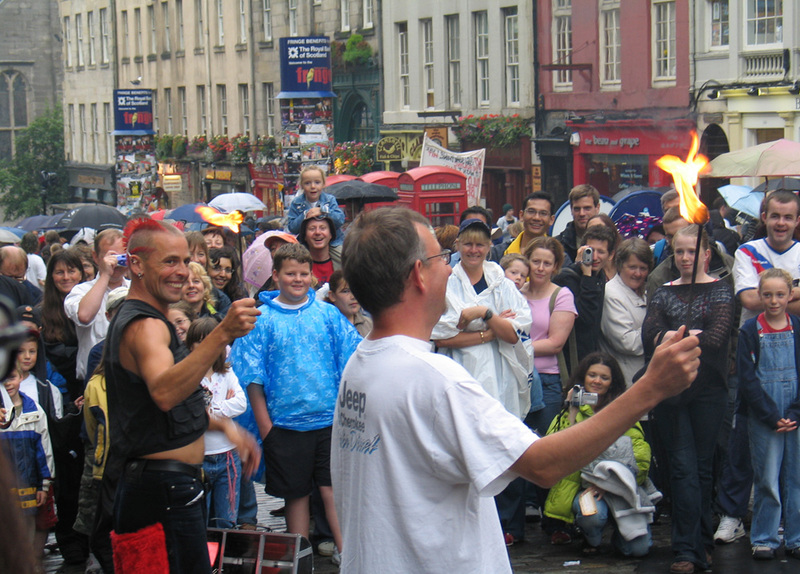 The Edinburgh Festival. This was started in 1947 to celebrate the performing arts and includes concerts, plays, ballets and operas. The Royal National Eisteddfod in Wales. Eisteddfod is an old tradition which was revived in 19th century. It originated in medieval times as a gathering of bards and minstrels, all competing for the prized chair at the noble’s table. 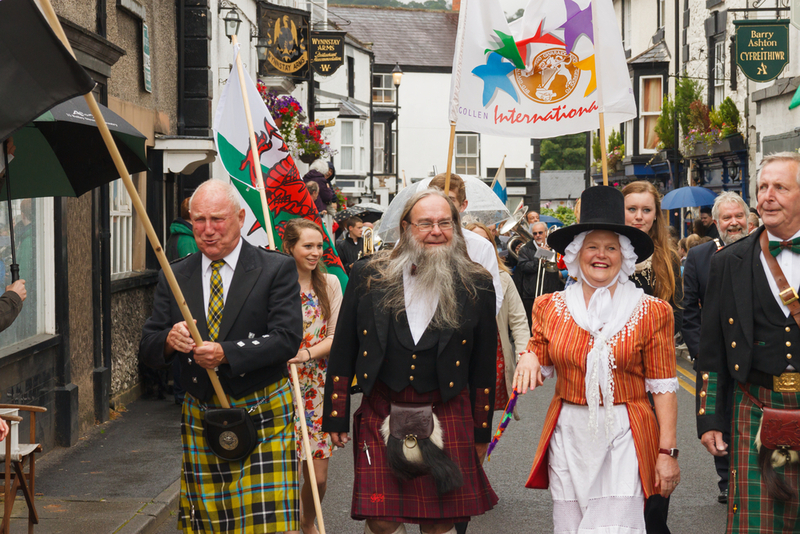 It is held in the first week of August and attended by people from all over Wales. 3. 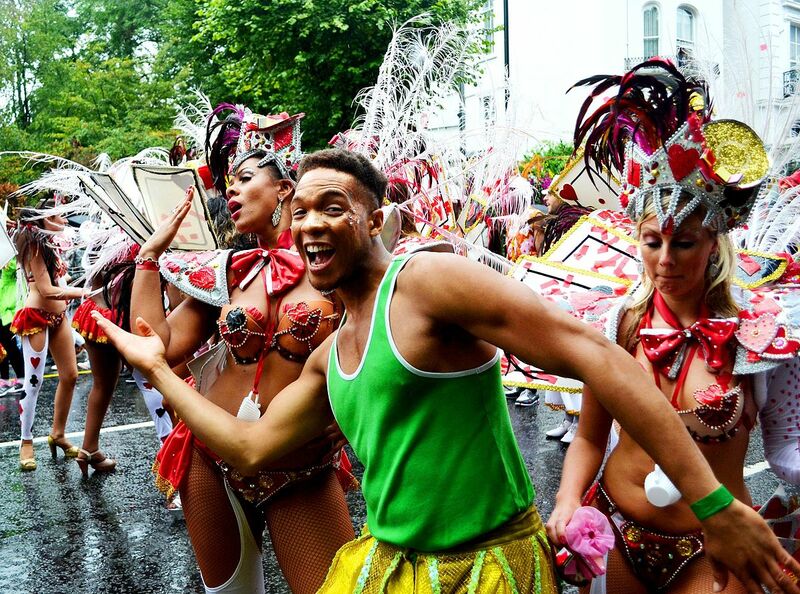 The Notting Hill Carnival in London. This festival is held on the last Monday of August i.e. Bank Holiday Monday in the UK. It is a colourful procession with elaborate costumes. It originated in the 1960s to celebrate the cultural traditions of the many Caribbean immigrants who came to Britain at that time. August 4th 1914: the First World War started. August 14th 1945: the Second World War ended. August 15th 1872: the first regular police detective force was formed. August 25th 1919: daily flights between London & Paris began, thus starting the first international air service. August 31st 1997: Princess Diana was killed killed in car accident in France. Sloes (wild damsons) in the hedge along Collingham Lane. 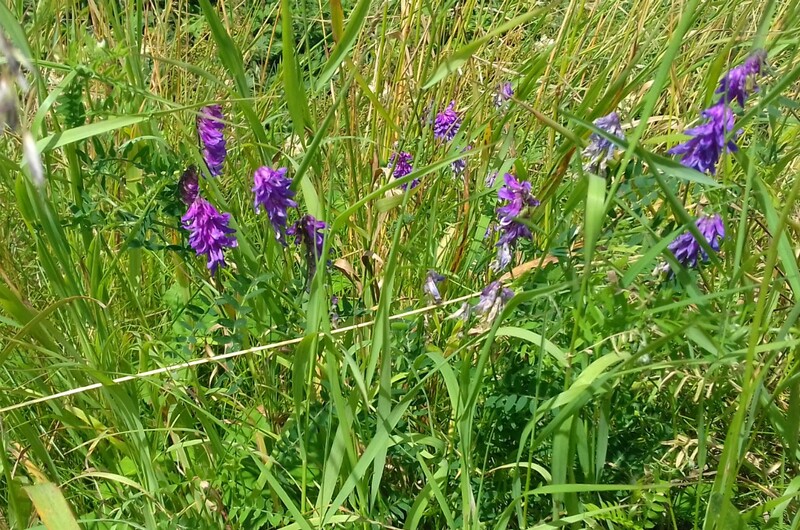 And absolutely lastly, here are a few photos of our garden as we amble along into August. I was delighted to see the lovely butterflies in our front garden this morning (August 1st). They really love the Buddleia davidii bush! ‘Invincible’ dwarf pear tree. These taste quite like a popular pear called a ‘William’.